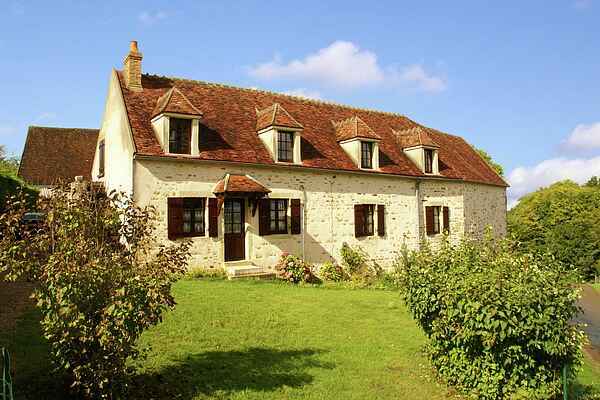 This rustic holiday home with terrace and garden is beautifully set against the hills of Champallement. The house is surrounded by a voluminous garden. It's virtually begging for children to play in it. While you enjoy the amazing, panoramic view from your bench swing or dive into a good book, they'll be frolicking in the grass. You'll find plenty of amenities right in the area. There's a baker and a grocer at Brinon-sur-Beuvron (6 km) and a restaurant in Guipy (8 km). Corbigny (18 km) has a full-size supermarket. The house is located in Champallement, a picturesque town, charmingly nestled between centuries-old forests and hills. It lies directly between Nevers (47 km), famous for its cathedral and earthenware, Château-Chinon (54 km) and Vézelay, with its Basilica of St. Madeleine (44 km). 1 kilometer away, you can visit the archaeological excavation site at Compierre. At the museum in Clamecy (38 km), you can learn more about the Gallo-Roman excavation. On the outskirts of Champallement, lies a fishing lake. You can get your one day licence at the town hall. For a more daring day out, rent an all-terrain vehicle in Sichamps (23 km). Or pedal your way down the train tracks on a railbike in Varzy (22 km). For some aquatic recreation, find your way to Etang du Merle (13 km) or the beaches of Vaux (14 km) and Baye (17 km). In St. Saulge (16 km), you can rent a bike.